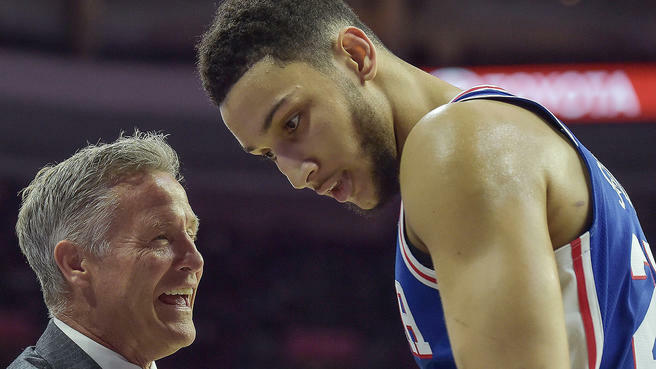 SIXERS WIN DESPITE 27 TURNOVERS: ‘I’M SHOCKED WE WON THIS GAME,’ BROWN SAYS! Ben Simmons and Joel Embiid certainly aren’t acting like playoff rookies, and J.J. Redick provided the veteran leadership that the Sixers so desperately needed. 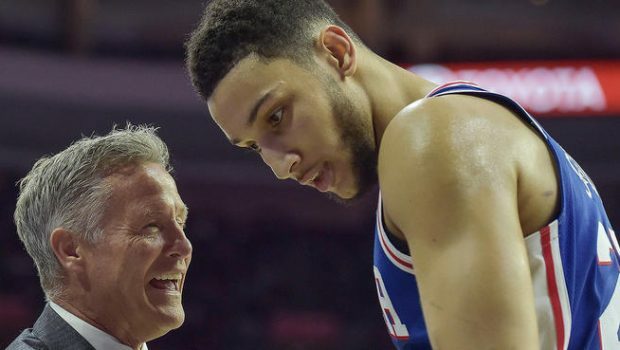 Simmons was the first rookie to since Magic Johnson in 1980 to have a playoff triple-double, Redick led Philly with 24 points, and the 76ers moved one win from the second round by topping the Miami Heat, 106-102, to take a 3-1 lead in their Eastern Conference first-round series. The Sixers turned the ball over 27 times, shot 7 for 31 from 3-point range and trailed by 12 late in the third quarter in an extremely hostile environment against a desperate opponent. Despite it all, the 76ers were unfazed. They turned a 10-point deficit into a 7-point lead with a 19-2 run that ended midway through the fourth quarter, then absorbed the best shot Dwyane Wade could throw at the 76ers in the final minutes before heading home with a chance to close out the Heat in Game 5 on Tuesday. Wade led all scorers with 25 points off the Heat bench, 12 of them in the fourth. But it wasn’t enough. Wade doesn’t have a contract for next season. He has said if he plays, he’ll be back with Miami — though there are no guarantees. “I’m focused on the next game, trying to win that one,” Wade said. Simmons’s triple-double consisted of 17 points, 13 rebounds and 10 assists. Embiid finished with 14 points and 12 rebounds for Philadelphia. “We took care of business,” Embiid said. Previous PENN STATE’S JAMES FRANKLIN, MEET KEEGAN-MICHAEL KEY, WATCH! Next PHILS PASTE BUCS 6-2, IMPROVE TO 8-1 AT CITIZENS BANK PARK!